To be able to serve good, and I mean really good bar-be-cued chicken is an art that few can achieve. Grilling sure is an art. One has to be very careful when grilling chicken – it’s either burnt or raw! In my mind, there can be nothing worse than landing up with a combination of charred fatty skin smothered by a sweet, sticky bar-be-cue sauce smoking hot! Ideally, the chicken should be crisp on the outside, moist and tender on the inside. It should have a nice smoky flavour and be nicely sticky. This can be achieved by cooking the chicken on low heat till it is nearly done and save the sauce till the last few minutes of cooking. Most of the flavour comes from the spice rub that’s rubbed on the chicken well before it is cooked. This allows the flavour to completely permeate through the chicken during the long, slow cooking. Slather on the sauce when the chicken is cooked. The sauce needs only five minutes to adhere nicely to the chicken. Since the fire isn’t really hot, the chicken won’t get that burnt look, just a nice coating and shine. But this is the time to be attentive and careful. If the fire is too hot, it can easily burn the sauce, which is what you do not want. Be ready to remove the chicken at the first sign of charring! Keep the heat low. 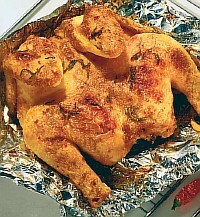 In order to keep your chicken moist, baste it over low heat with apple juice. You can use almost anything other than wine for basting. This is because wine causes the chicken to dry out and depending on what type of wine you’re using can even cause a fire! It is the sugar in the sauce that causes burning. Rubs are a great way to season your chicken without the risk of burning. Marinades offer the best of both worlds. Marinating your chicken before you grill allows your flavour to permeate the meat and it’ll be moist and juicy – perfectly grilled chicken! Method : Combine all ingredients in a small bowl. Store dry spice rubs in the pantry for two to three weeks. Store rubs with fresh ingredients in the refrigerator for up to two days. Apply rubs just before grilling, or for more flavour, rub the mix into the meat and refrigerate for several hours before grilling.